Having sold out of the 2010 blanc de blanc last October, it was with much anticipation that I tasted the 2011 vintage. Madden’s Rise is on one of the best vineyard sites on the Yarra Valley floor. Located in Coldstream, on the famous south side of the Maroondah Highway. Quietly producing premium grapes that are snapped up by some of the big producers in the valley, they also make a small amount of their own characterful wines, mainly sold at their very cool cellar door. A visit to the rustic and friendly cellar door is a must for those who like to discover the hidden gems of the Yarra Valley. Madden’s Rise 2011 Blanc de Blanc. Sparkling Chardonnay. 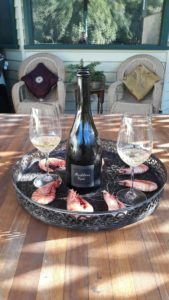 While not being considered a favourable vintage for red wine in the Yarra Valley, due the cold and wet ripening conditions, it was a classic vintage for sparkling wine. A silver lining to the grumpy red wine cloud. This extended time on the lees give a complex aroma of freshly baked sourdough bread, with yeasty notes hinting at cheese, and even a background hint of Vegemite – due to the complex aromas of extended yeast lees contact. The palate is quite fine, almost delicate, reflective of the cool vintage. Although the colour has more golden hues that are evident in more commercially produced bubbles, the palate is delicate, clean and fresh. In a traditional flute – the bead is fine and delicate. The taste is still fresh and vibrant, reminiscent of fresh, crunchy, Granny Smith apples. This crispiness is due to the wine not being put through malolactic fermentation. A great call by the winemaking team and owners to help the wine age slowly and gracefully. It is very expensive to cellar wines before release, so to have a sparkling wine just released after 7 years on yeast lees is a rare gift. I am pleased to report that it was delicious with the prawns you can see on the platter in the photo. Official Score – Bloody Yummy.